Episode 8 of the Copeland Coaching Podcast is live! I'm so excited to share this great episode with you! If you haven't listened to one yet, this is the one to start with. This week we talk with Glassdoor.com Career Trends Analyst, Scott Dobroski. Scott shares great insights on salary negotiation, company research, and leveling the playing field in your job search. You can listen to the podcast below, or download it for free on iTunes (search for 'Copeland Coaching Podcast')! 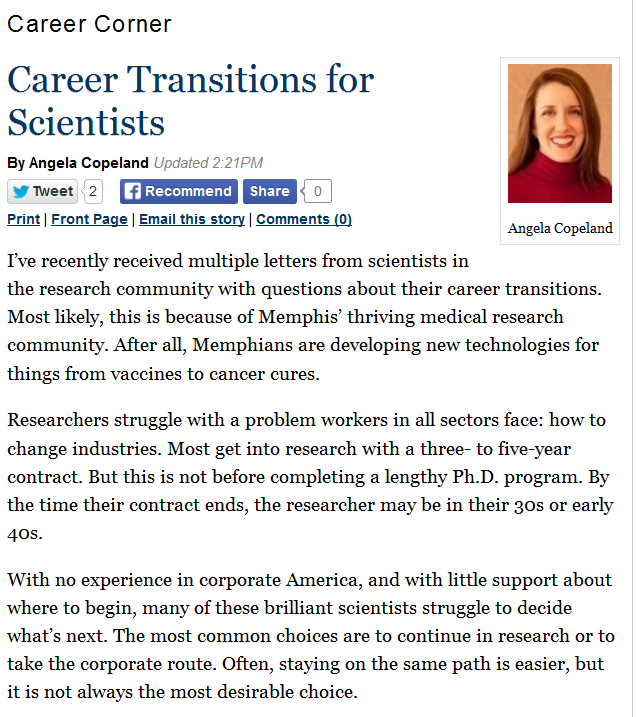 My latest Memphis Daily News column is out, “Career Transitions for Scientists.” In it, I provide advice on how to transition your job between different industries. I’ve recently received multiple letters from scientists in the research community with questions about their career transitions. Researchers struggle with a problem workers in all sectors face: how to change industries. Most get into research with a three- to five-year contract. But this is not before completing a lengthy Ph.D. program. By the time their contract ends, the researcher may be in their 30s or early 40s. With no experience in corporate America, and with little support about where to begin, many of these brilliant scientists struggle to decide what’s next. To read my entire article, and learn about how you can transition to a new industry, visit the Memphis Daily News site here. Also, if you have a friend who is in this situation (nearing the end of their research contract), please forward a copy of my article to them. I was truly surprised to learn how many people are struggling with the issue of whether or not to leave research, and how to get into corporate. 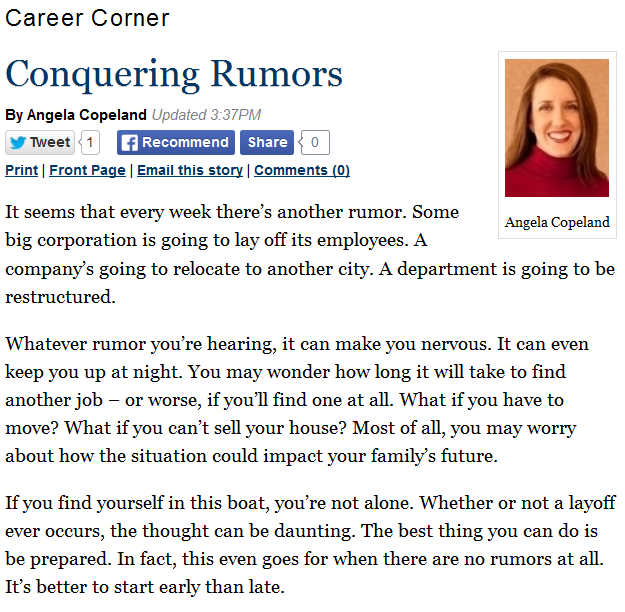 My latest Memphis Daily News column is out, “Conquering Rumors.” In it, I provide advice on how to prepare when you hear rumors that a layoff may be coming at your job. It seems that every week there’s another rumor. Some big corporation is going to lay off its employees. A company’s going to relocate to another city. A department is going to be restructured. Whatever rumor you’re hearing, it can make you nervous. It can even keep you up at night. You may wonder how long it will take to find another job – or worse, if you’ll find one at all. What if you have to move? What if you can’t sell your house? Most of all, you may worry about how the situation could impact your family’s future. If you find yourself in this boat, you’re not alone. Whether or not a layoff ever occurs, the thought can be daunting. The best thing you can do is be prepared. In fact, this even goes for when there are no rumors at all. It’s better to start early than late. To read my entire article, and learn about how you can conquer layoff rumors, visit the Memphis Daily News site here. My latest Memphis Daily News column is out, “Dressing for Career Success.” In it, I provide tips on what to wear to 'knock 'em dead' at your next interview. You’ve been applying online for months, and finally something has clicked. You have an interview in a few days for the perfect job at the best company in town. This scenario sounds great on the surface, but can often lead to stress and anxiety when job seekers prepare to suit up for their next interview. 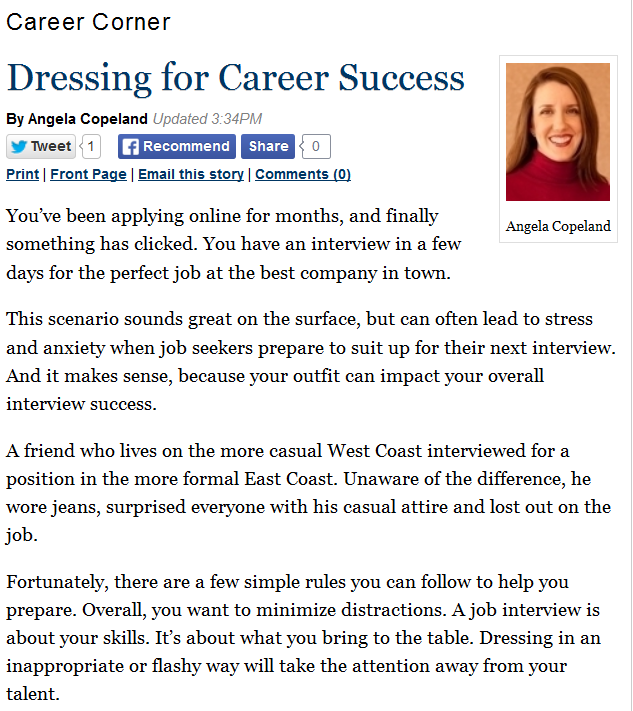 And it makes sense, because your outfit can impact your overall interview success. To read my entire article, and learn about how you can dress for success, visit the Memphis Daily News site here. It's not a job interview, but it is an excellent learning and networking opportunity. It can often help you to identify jobs you don't want, and can open your eyes to jobs you hadn't considered. I have found this to be true in both my personal job searches, and with my new podcast. As the title of this blog suggests, this is an exciting day. Today, I'm launching the first episode of the Copeland Coaching Podcast! 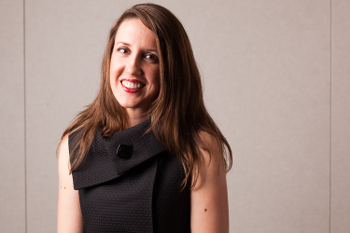 In my interview, Amy shares tips on job searching, dressing for success, and nailing the interview. If you've ever had questions about what you should or shouldn't wear to an interview, this podcast is for you! Amy also gives great tips on what to do after an interview to follow up with employers and to increase your chances of getting the job. You can listen to the podcast in two ways. First, it's available for download on iTunes. You can also listen on SoundCloud.com. So, whether you want to listen on your desktop, laptop, mobile phone, or tablet, you're covered! Listen from wherever, whenever. If this is your first time to listen to a podcast on iTunes, you may not see the episode above listed right away. If you're having trouble, search for "the podcast app" in the App Store. After you download The Podcast App, you can search for the "Copeland Coaching Podcast." You should then be able to view the podcast episode for download. Once you download it, you can begin listening! And speaking of switching fields and findings happiness, I'm searching for a Social Media Intern for Copeland Coaching. At a minimum, they should have experience personally using social media. But, it's not critical that they've used social media in business before. This will be a great learning opportunity for the right candidate. My latest Memphis Daily News column is out, “Scaling Your Career.” In it, I encourage you to consider transition between different industries - and to learn about the differences that may hold you back during your search. One of the most exciting career transitions job seekers make is changing industries. You may want to move from nonprofit to corporate or from a large organization to a small business. These moves expose you to a new workplace and can reenergize you if you’re feeling burnt out in your current environment. However, the one issue many job seekers struggle to understand is scalability. Scalability is an understanding of how your old work environment translates into your new work environment. For example, a friend was recently working as a manager at a major university. He had 75 employees, large-scale projects and an impressive budget. Interested to move to a corporate job, he was concerned about titles such as “manager” and “director” that appeared on job postings. In the university setting, these titles were reserved for a select few with expansive responsibilities. To read my entire article, and learn about how you can learn more about how to scale your career, visit the Memphis Daily News site here. Does this resume make me look old? My latest newsletter is out, "Does this resume make me look old?" If you're in the later part of your career and find yourself starting over, you may be worried about a number of things. 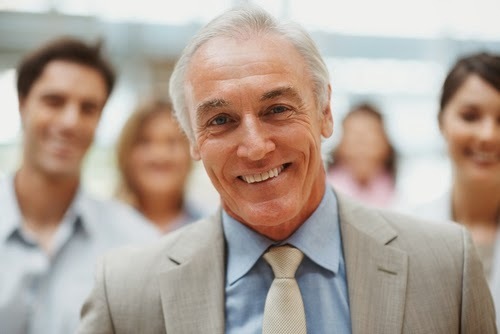 In particular, many older job seekers are concerned about the discrimination they may face during the interview process. And honestly, it's for good reason. First impressions happen quickly and make a lasting impact. Even the Bureau of Labor Statistics agrees. Unemployed workers who are 55 and older stay out of work 20% longer than those between 25 and 54. To learn the steps to take to avoid this dilemma and shave years of your resume, check out my latest newsletter here. Subscribe to the Copeland Coaching newsletter here.